To celebrate my recent birthday, Mr W and I went out to Dinner. 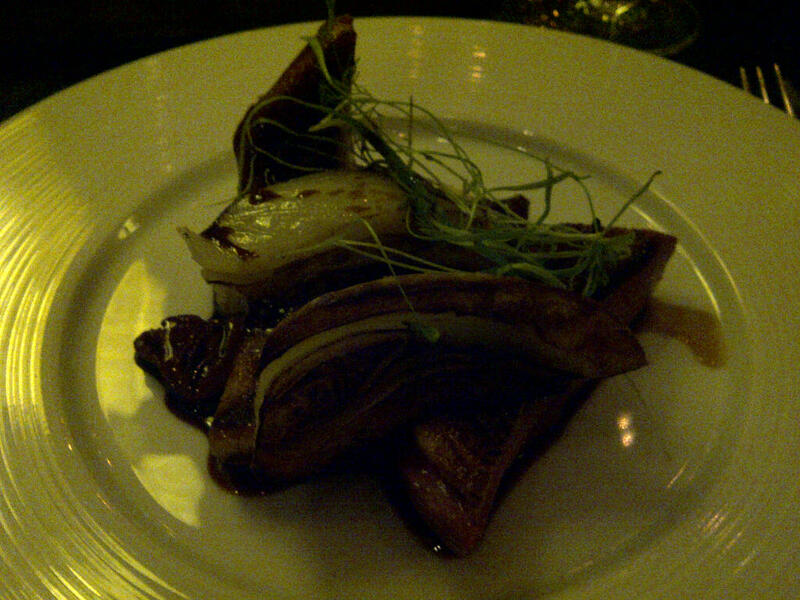 This sounds like a fairly unremarkable occurrence, especially for a food blogger, but when I say that it was actually Dinner by Heston Blumenthal, the Michelin starred restaurant in London’s Mandarin Oriental Hotel, you will then understand that it was actually a more special occasion than it sounds! Anyone who is expecting a London version of the Fat Duck experience at Dinner will be disappointed. It’s still quirky in a way, but combines a touch of linguistic playfulness on the menu with dishes inspired by historic British gastronomy. Each dish is inspired by a recipe from a historic cook book (these are referenced on the back of the menu), some of which date back as far as 1300, and have delightfully intriguing names such as Salamugundy, Rice and Flesh, A Made Dish of Parmesan and Tipsy Cake. 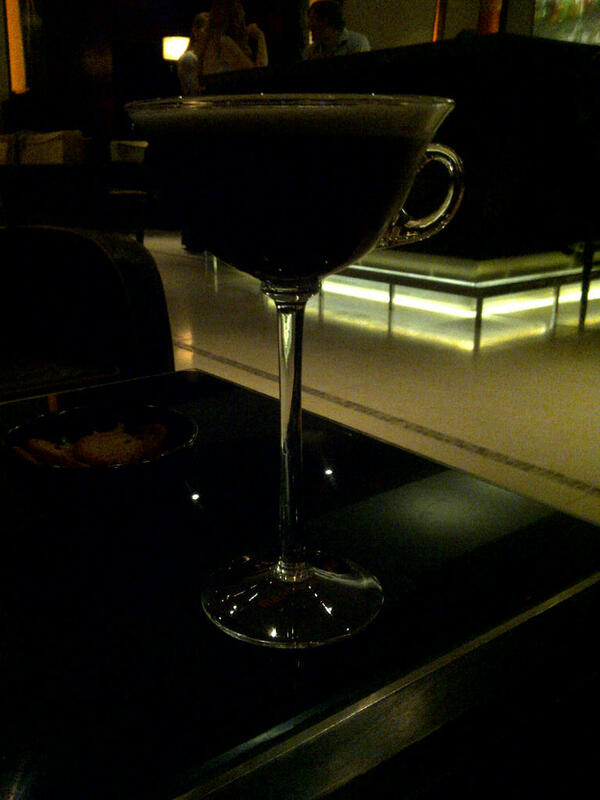 We had a cocktail in the Mandarin Bar before our meal – Mr W’s ‘Orient Espresso’ warranted a photo, due to the unusual glass, and his citing it as one of the best Espresso Martinis he’s had. Several of the bar staff saw us consulting the Dinner menu as we had our drinks, and told us about their favourite dishes. The staff’s detailed knowledge of the menu was a recurring theme throughout the evening. The restaurant itself is quite large, and on a Saturday night, even at 10.15 when we sat down to eat, was buzzing. There’s a semi-open kitchen: the kitchen is behind floor to ceiling glass walls, so – depending on where you sit – you can see everything that’s going on, but without the noise or heat that normally goes with a busy open kitchen. 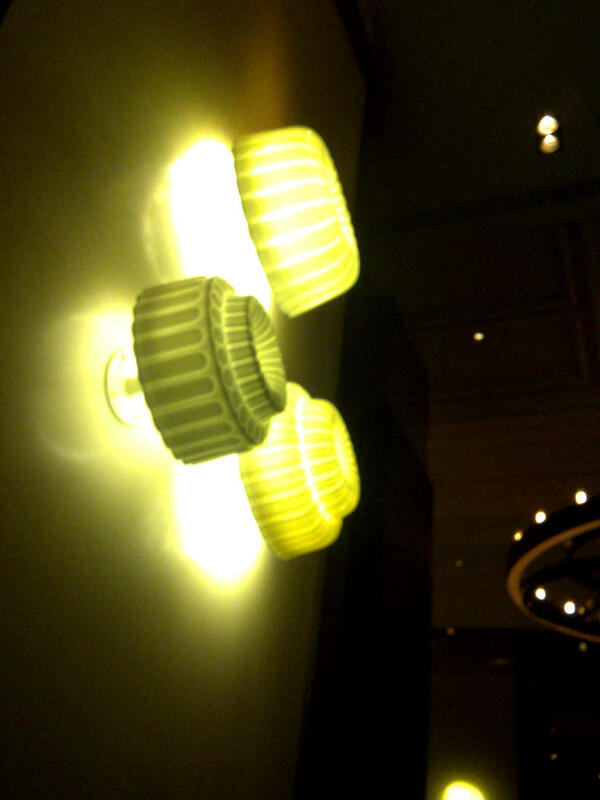 Décor is modern, but with a few quirky twists – such as jelly mould lampshades on the walls. 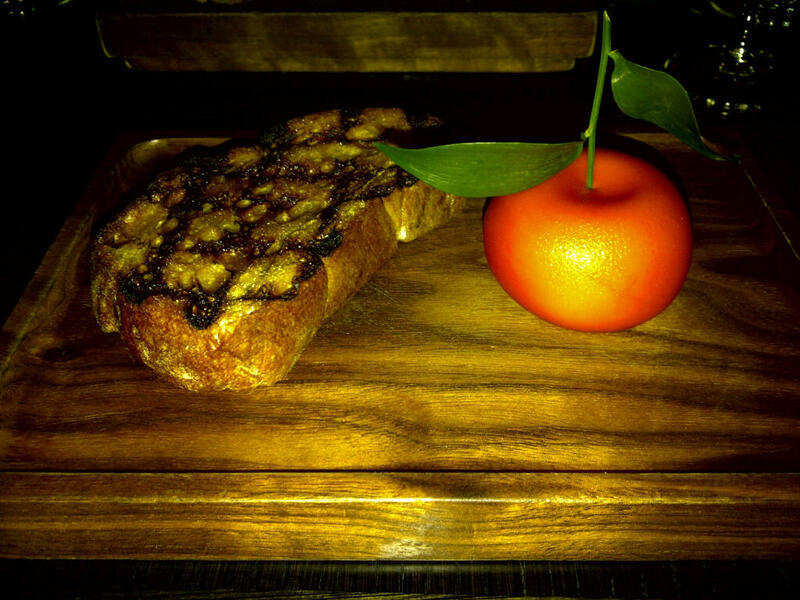 To start, I chose a dish which I’d heard about before visiting the restaurant: Meat Fruit, which consisted of mandarin, chicken liver & foie gras parfait, served with grilled bread (I think that’s also known as toast!) This was probably the dish most reminiscent of Heston’s more quirky creations, as the parfait was encased in a mandarin gel, and made to resemble the fruit. The bread looked a bit like a fillet steak too, but I’m not sure whether this was deliberate. My photograph is unfortunately fairly appalling, due to poor light (from the jelly moulds!) but if you Google ‘meat fruit heston’ you can see some images of what it should look like! The parfait was deliciously rich and irony, totally smooth, and a pleasantly soft texture, despite being chilled. 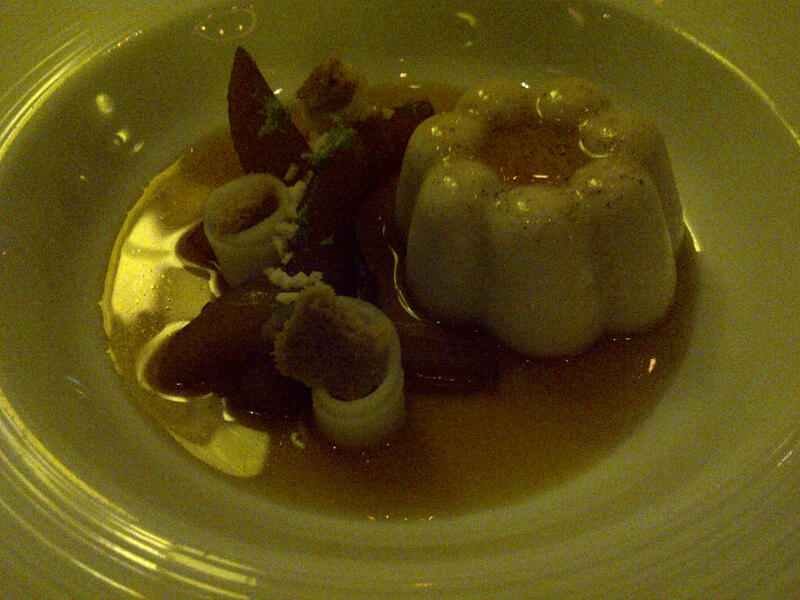 The mandarin gel gave a hit of orangey flavour, but its texture was barely noticeable – which was a good thing. The ‘grilled bread’ was actually – in my opinion – a little bit burnt: when it came to the table, I could smell carbon, and it had a bit of a burnt taste to it, but we had bread on the table so I ate some of this with the parfait instead. Mr W chose Savoury Porridge, which was served with frog’s legs, smoked beetroot, garlic, parsley & fennel. 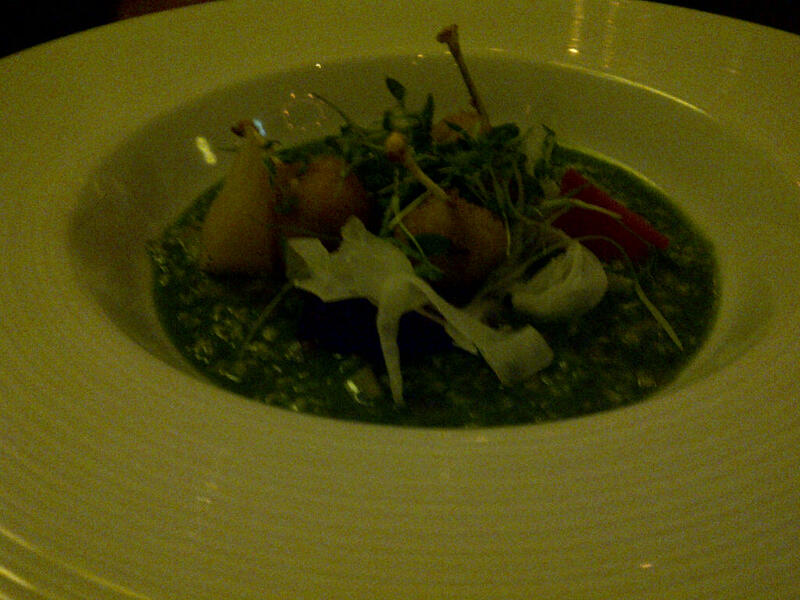 This wasn’t the prettiest of dishes to look at, but was certainly unusual! For me, the savoury taste of the garlic and parsley combined in an oaty porridge just didn’t quite work – but Mr W loved it, so we definitely made the right choices in our orders! Other than the texture of the oats, which I wasn’t keen on, the flavours of the dish combined perfectly, and for anyone disappointed not to find snail porridge on the menu, I think savoury porridge with frog’s legs is hopefully a good consolation! 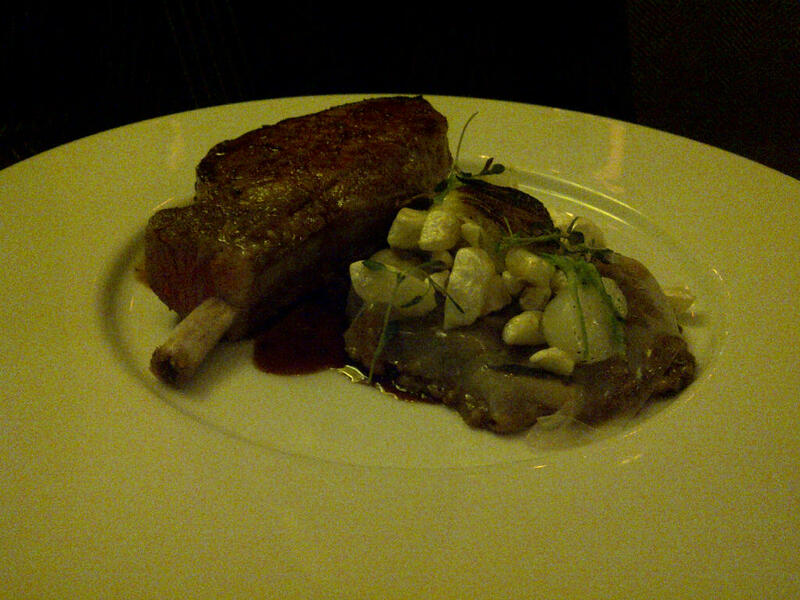 Mr W’s main was a Blackfoot Pork Chop, served with turnips, spelt, ham hock & Robert sauce. For a ‘humble’ pork chop, this was actually one of the stars of the meal: it was cooked pink, and was thick and juicy – it almost looked like a fillet steak when it arrived (save for the bone!) The spelt and ham hock were served under a jelly glaze, and topped with what we initially thought was some sort of popcorn (perhaps made from spelt) but which turned out to be crispy pork skin! Again, had I known this, I wouldn’t have been eager to try, as I’m not keen on pork crackling or scratchings, but these were lovely, so I’m glad I was only enlightened after the meal! Mr W really enjoyed this dish and was blown away by how a seemingly humble pork chop managed to be transformed into something so special. We shared sides of green beans with shallots and fries. The fries were triple cooked, and were perfectly crispy on the outside, but – for me – were a little too thinly cut, so lacked the fluffy centre that characterises really good triple cooked chips. For dessert, I chose Quaking Pudding, which turned out to be a kind of milky, custardy jelly, which wobbled delightfully (as did I after the amount of food I consumed that evening) and was served with pear, perry, caramel & lime. The pear was served both poached and raw and combined with the caramel and lime sauce to add a delicious sweetness to the creamy pudding. Mr W opted for Brown Bread Ice Cream, which was served with salted caramel and a biscuit. Unfortunately, or fortunately, depending on whose perspective you are coming from, he found this a bit too sweet, so it fell to me to finish it off – and for me it was one of the best dishes of the night! The relative savouriness of the ice cream was perfect with the caramel, which had a rich, creamy texture, and the biscuit added substance to the dish. I do have an extremely sweet tooth, but for anyone who shares that, this is a divine pudding. A final quirk came at the end of the meal when we were served an extra dessert – a bit like an amuse bouche, but at the opposite end of the meal. 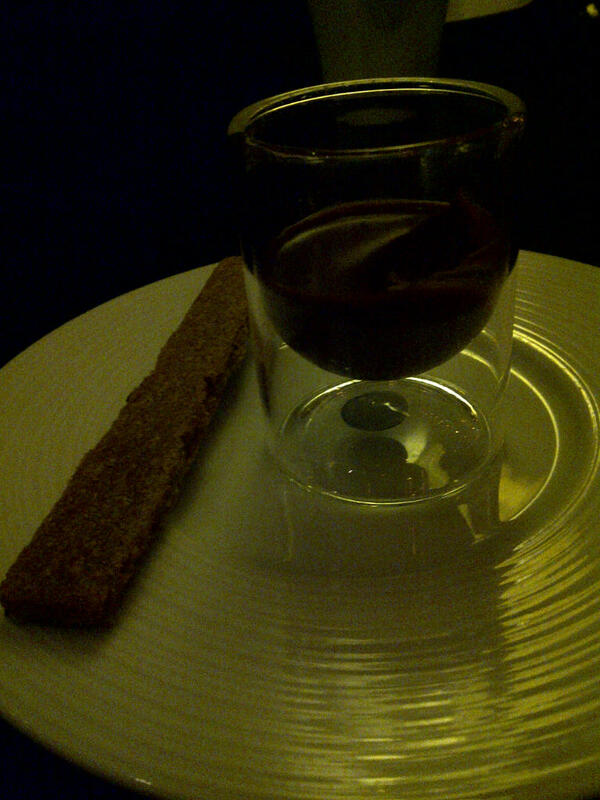 This was a dark chocolate mousse infused with Earl Grey tea and served with a cardamom biscuit. 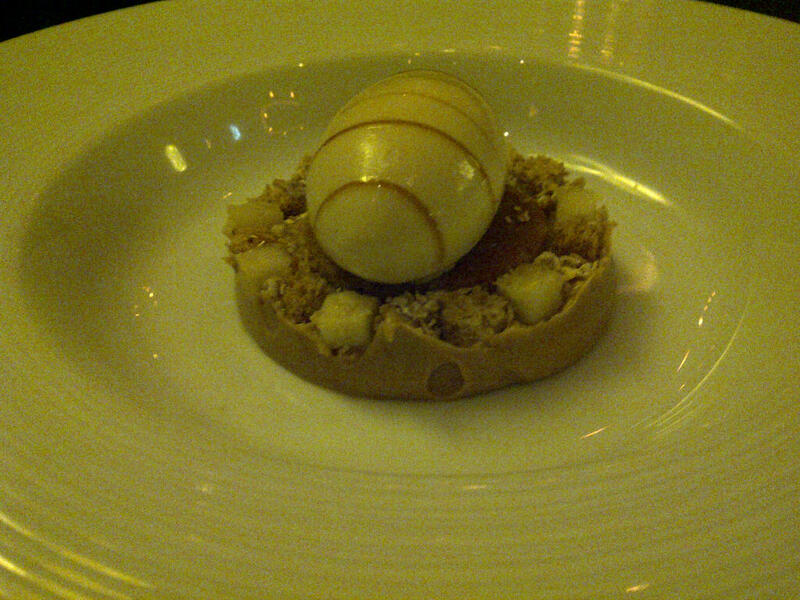 It was very rich, but not too creamy, and the Earl Grey made it surprisingly refreshing for a chocolatey dessert. It was at this point that I realised I had in fact had three puddings, but it was my birthday, so I was allowed! Aside from the couple of very minor things I’ve mentioned, our meal was pretty much flawless, and just quirky enough to be really special without losing sight of taste, texture and damn good food! What really made the visit feel like something really special, though, was the service. We had one waitress, Patricia, who looked after us for the majority of our visit, and she was truly fantastic – having the knack of knowing exactly when we needed her and being there, but being totally unobtrusive the rest of the time. She knew the menu inside out and spoke with passion and enthusiasm about the dishes as she answered our questions. The sommelier was similarly brilliant – we told her roughly what we wanted and she made some recommendations that would complement our food choices. We settled on a Fleurie, which was lovely. Wine top ups were similarly timely yet unobtrusive. Prices, as you’d expect for a Michelin starred restaurant in London that’s been named as one of the best in the world and bears the name of someone as renowned as Heston, were fairly eye-watering, with main courses ranging up from £30, starters around the £15 mark and desserts £10. Our wine was at the lower end of the list and was around £50. This could be off-putting if you thought too much about it, but if you have the budget to do it and have decided you want the experience, then the best thing you can do is just forget about the prices and enjoy – I’d thoroughly recommend it!